Butternut Squash and Black Bean Tostadas – black beans seasoned with chili powder and lime juice on top of butternut squash and crunchy tostadas. Topped with queso fresco and crisp lettuce. Perfect for meatless Monday! Did you watch It’s the Great Pumpkin, Charlie Brown last night? I’m not a huge Peanuts fan but the kids and I watch it every year. And every year I feel bad because my husband loves Peanuts but he’s never home to watch it! Him not being home also explains all the meatless meals we’ve been eating lately. I can’t even tell you the last time I cooked something with meat. Mostly because I don’t want to buy it and have it go bad when I inevitably decide to just have wine and graham crackers for dinner every night. But also because I’d rather spend my grocery money on candles and dog sweaters. Butternut Squash and Black Bean Tostadas! Butternut squash and black beans are one of my alltime favorite combinations. Sounds weird, I know, but you’ve got to give it a try! They work especially great in dishes like this, with kind of Mexican influences. The beans are tossed with chili powder and lime juice and I just love it with the slight sweetness of the butternut squash. You top it off with lettuce and queso fresco! Or in my case, feta, because the queso fresco fell out of the grocery bag and stayed in the trunk for literally a week and a half before I remembered to throw it out. 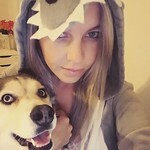 Once again, don’t judge me. Bring a large pot of water to a boil. Add butternut squash and let cook until tender, about 15 minutes. Drain and return to the pan. Add 1 1/2 teaspoons chile powder and salt. Mash until almost smooth. Meanwhile, combine beans, green onions, lime juice, cumin and the remaining 1/2 teaspoon chile powder in a mixing bowl bowl. Spread about 1/4 cup mashed squash on each tostada. Top each with about 3 tablespoons of the bean mixture, 1/4 cup lettuce and 1 tablespoon cheese. 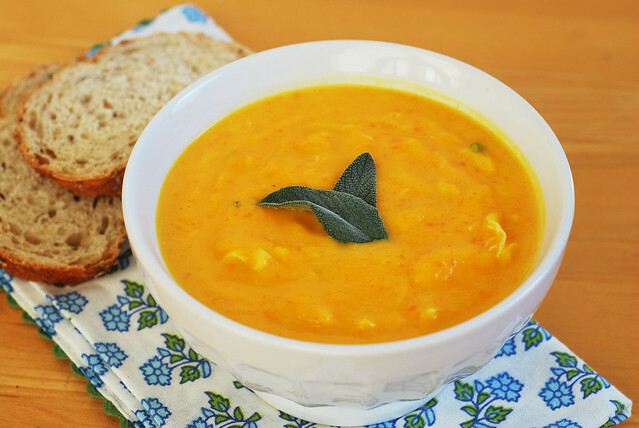 Want more butternut squash recipes? 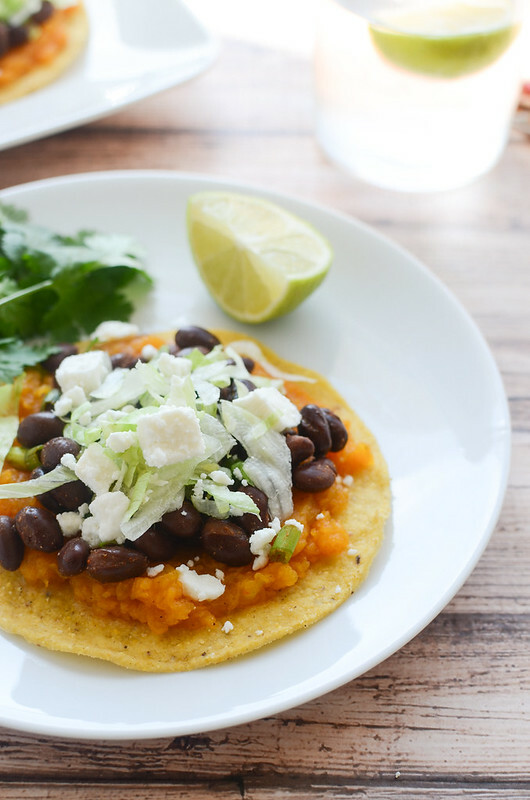 6 Responses to "Butternut Squash and Black Bean Tostadas"
haha, I do the same thing when my husband is traveling for work .. meatless meals all the way! 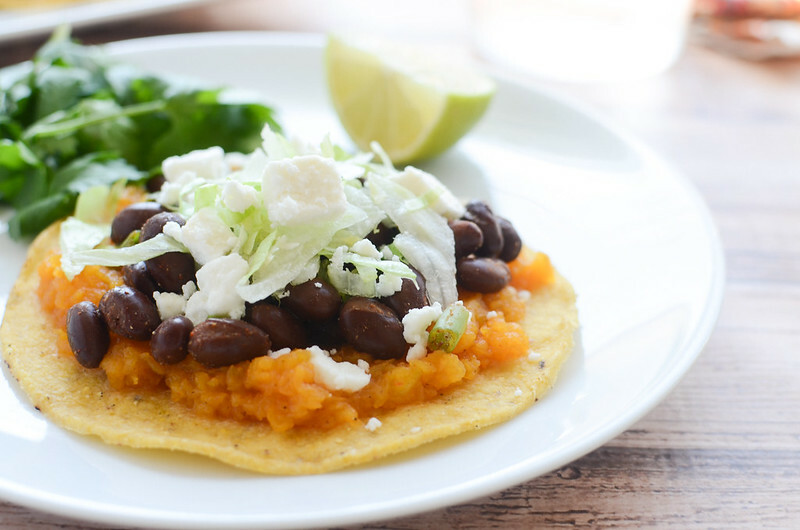 I love Butternut squash and black beans together and these tostadas look fabulous! and hey, I’m with you on the candles . . I go a little crazy with the candles in the fall and winter! 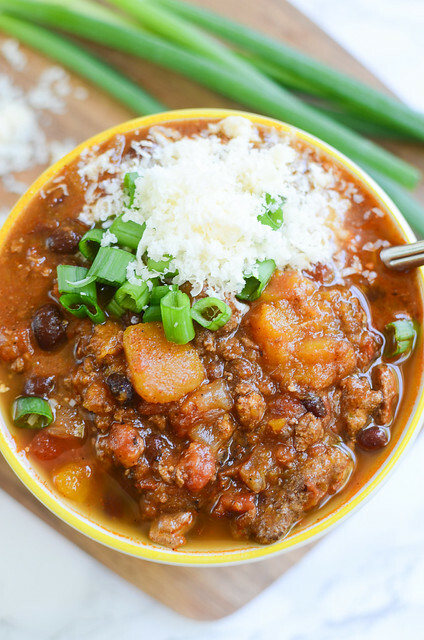 We love the butternut squash black bean combination! Can’t wait to give these a try! love the combo of butternut squash and black beans!! 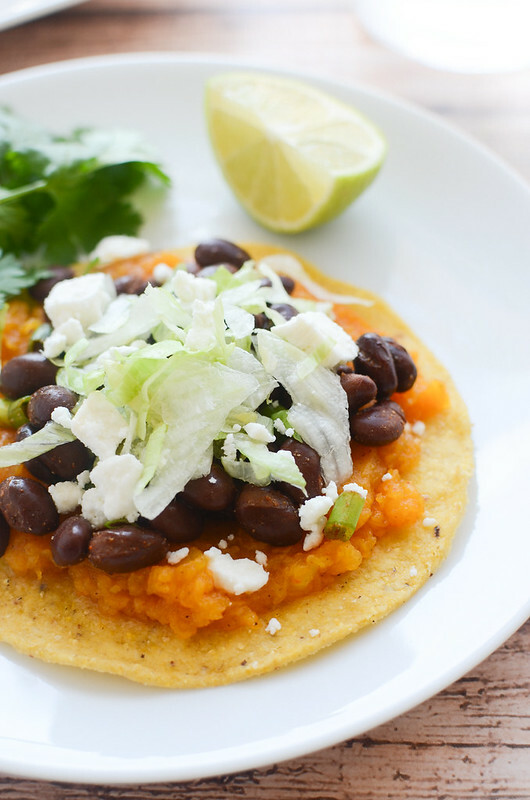 I love butternut squash and black beans together and what a great idea on a tostada — yum!! 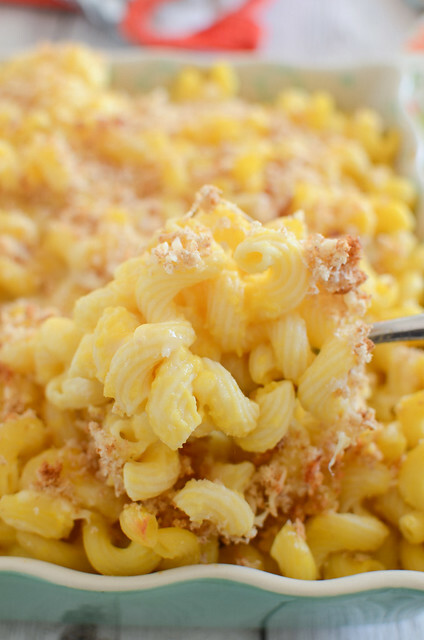 And meatless meals are always so filling with some kind of squash – so I love this!